I know very little about Pinball Machine collecting. But I remember my neighbors had an old pinball machine in their basement we used to like to play when we were kids. All I remember is it was probably from the 60s (50s or early 70s is possible too) it already felt kinda dated when we played it in the late 70s/early 80s. It had a beach theme. Had pictures of a bunch of teens? on a beach, I think there might have been surfing or a dune buggy. maybe a life guard. Art style reminded me a little of the Archies, but I don't think it was the Archies. Don't know what else to say about it? Any ideas on what it might be? A really old pinball machine. 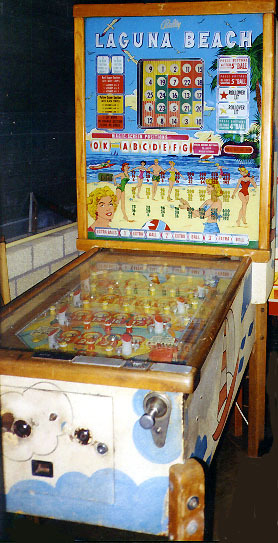 Go to pinside.com and search on Gottlieb machines from the 50s and 60s. See if this link works. I didn't see the specific machine in there, but the art style in those is similar. Just curious, what made you think it was a Gottlieb machine? I figured start there and then search for a Williams machine. Not sure when it was released. My guess would be the late 50s. Edited by Spoon, Wed Apr 17, 2019 7:00 AM.